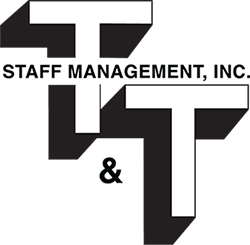 About Us – T&T Staff Management, Inc.
Hello!We are T&T Staff Management, Inc. Established in 1992, T&T Staff has become the largest, most financially sound Professional Employment Organization (PEO) in the Southwest. Our focus at T&T Staff is to assist you with your business whether large or small, to control costs, save time and eliminate time-consuming paperwork. Our professional staff is prepared to help you get in compliance with federal agencies such as OSHA, DOL, IRS, EEOC, and more which in turn can reduce costly employee turnover. We’ll take care of the complex maze of federal, state and local regulations so you don’t have to. Our Safety and Risk Management Department is staffed with four Safety Specialist all who are OSHA 500 & 501 authorized trainers and who are all certified CPR/First Aid Instructors. Better human resource services, accurate payroll service, timely claims investigations, reduced accounting cost and outstanding customer service – that’s who we are. As a Character First! Company we strive to maintain the highest ethical standards in business holding to the belief that partnerships established on integrity are long lasting. T&T Staff … the business solution that works for you. Professional employer organizations (PEOs) enable clients to cost-effectively outsource the management of human resources, employee benefits, payroll and workers’ compensation. PEO clients focus on their core competencies to maintain and grow their bottom line. Businesses today need help managing increasingly complex employee related matters such as health benefits, workers’ compensation claims, payroll, payroll tax compliance, and unemployment insurance claims. They contract with a PEO to assume these responsibilities and provide expertise in human resources management. This allows the PEO client to concentrate on the operational and revenue-producing side of its operations. A PEO provides integrated services to effectively manage critical human resource responsibilities and employer risks for clients. A PEO delivers these services by establishing and maintaining an employer relationship with the employees at the client’s worksite and by contractually assuming certain employer rights, responsibilities, and risks.